ww2dbaseThe nearly identical Willys MB and Ford GPW reconnaissance cars were manufactured from 1941 to 1945. They made up 98% of all models built in WWII and they are the iconic World War II Jeep. ww2dbaseOn July 11, 1940, with World War II dawning near, the US Army approached 135 U.S. automotive manufacturers to submit designs to replace its existing, aging light motor vehicles; mostly motorcycles, sidecars, and some Ford Model T's. Companies' bids were to be received by just eleven days later, then they had 49 days to submit their first prototype and 75 days for completion of 70 required test vehicles; 130 days in all to design and deliver the vehicles. ww2dbaseThe Army's specifications were equally demanding: a general purpose personnel or cargo carrier especially adaptable for reconnaissance or command; designated as 1/4-ton four-wheel drive Truck, crew of three, wheelbase of no more than 75 (later 80) inches, tracks no more than 47 inches, fold?down windshield, 660 lb payload, and be powered by an engine capable of 85 ft-lb (115 Nm) of torque. The most daunting demand, however, was that it have an empty weight of no more than 1300 lbs (590 kg). ww2dbaseOnly three companies entered: American Bantam Car Company, Willys-Overland Motors, and the Ford Motor Company. Though Willys-Overland was the low bidder, Bantam received the bid, being the only company committing to deliver a pilot model in 49 days and production examples in 75 days. Bantam built their first prototype, officially named the "Pilot" but nicknamed the "Blitz Buggy" and later "Old Number One." It was delivered to the Army vehicle test center at Camp Holabird, Maryland on September 23, 1940.
ww2dbaseSince Bantam did not have the production capacity to deliver on the scale needed by the War Department, the two losing bidders, Ford and Willys, were encouraged to complete their own pilot models for testing. As testing of the Bantam prototype took place, Ford and Willys technical representatives were given ample opportunity to study the vehicle's performance. Moreover, the War Department forwarded the Bantam blueprints to Ford and Willys, claiming the government owned the design. ww2dbaseBy November 1940 Ford and Willys each submitted prototypes to compete with Bantam. The two pilot models, the Willys Quad and the Ford Pygmy, turned out to be very similar to each other and were joined in testing by Bantam's entry, now called the Bantam Reconnaissance Car 60 (BRC 60). US armed forces were already under such pressure that all three cars were declared acceptable and orders for 1500 units per company were given. It was also acknowledged at this time the original weight limit (which Bantam had ignored) was unrealistic, and it was raised to 2160 lbs (980 kg). ww2dbaseFor these respective initial production runs, each vehicle received revisions and a new name. Bantam's became the BRC 40 (and the company ceased motor vehicle production after the last one was built in December 1941). After losing 240 lbs, Willys' changed the designation to "MA": "Military" model "A". The Fords were designated "GP": "G" for "Government" and "P" was Ford's code for passenger cars with 80-inch wheelbases. ww2dbaseBy October 1941, it became apparent Willys-Overland could not keep up with the production demand and Ford was contracted to produce them as well; but the Army required both to produce vehicles with interchangeable parts. Not wanting to have Ford parts end up on Willys vehicles without getting the credit, Ford stamped every one of their parts – right down to individual nuts and bolts – with a script 'F'. The Ford car resulting from this union was designated GPW, with the "W" referring to the "Willys" licensed design. During World War II, Willys produced 363,000 Jeeps and Ford some 280,000. Approximately 51,000 were exported to Russia under the Lend-Lease program. ww2dbaseAnother c.13,000 amphibious jeeps were built by Ford with the designation GPA (GP Amphibious; nicknamed "Seep" for Sea Jeep). Inspired by the larger GMC DUKW, the Seep was produced too quickly and proved to be too heavy, too unwieldy, and with insufficient freeboard. In spite of participating successfully in the September 1943 Sicily landings, most GPA's were routed to Russia under the Lend-Lease program. The Russians were sufficiently pleased with its ability to cross rivers that Russia developed their own version of it after the war, the Gaz 46.
ww2dbaseIt has become part of the Jeep lore to endlessly debate the origins of the name and many versions proclaim themselves to be the "true" story. Most sources agree, however, that "jeep" was a term known in some circles well before the introduction of these vehicles – but with disputed meanings. ww2dbaseSome authorities point to a cartoon character of the day called Eugene the Jeep. Because Eugene could go anywhere, "jeep" was a natural name for these sturdy scout cars; but this link is uncertain. 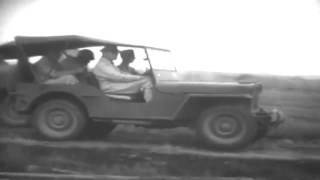 ww2dbaseOther accounts assert "jeep" contracted the letters "GP". GP for "General Purpose" was used widely throughout the US military, from tents to bombs, but never with respect to these vehicles. If anything, GP would have come from Ford's designation for their early production vehicles. However, the 4,456 Ford GP's are less than 1% of all WWII Jeeps made, and lend-lease meant most of these went to the far-flung corners of the globe. ww2dbaseThe most probable account – although controversial – is based on "jeep" as a slang term used by World War I soldiers for new recruits and for new unproven equipment (there are examples of inter-war contraptions entirely dissimilar from these scout cars being called jeeps). A Willys test driver, Red Hausmann, accompanied the car for its testing at Camp Holabird in 1940. He heard soldiers calling it a "jeep" and liked the way it sounded. In early 1941, Willys staged a press event in Washington, D.C. where their Quad prototype showed itself off by driving up the Capitol steps. Hausmann also gave a demonstration ride to a group of dignitaries, including Katherine Hillyer, a reporter from the Washington Daily News. When asked, Hausmann said, "It's a jeep." Hillyer's newspaper article on February 20, 1941 included a photo showing the Quad going up the Capitol steps and a caption calling the new scout cars "jeeps." This is the most likely source of the term being fixed into the public awareness. ww2dbaseThose who favor Eugene the Jeep or contracting "GP" are required to believe the Jeep was named from the GI's experiences after the vehicles entered service. Having the same name spring up from end-users world wide would not be expected; a variety of regional names is far more likely. Since jeeps were jeeps the day they arrived in-theater, some common starting point for the name has the greatest likelihood (like the well-documented Feb 1941 newspaper photo caption); but the debate will never be settled. ww2dbaseWillys made its first 25,000 MB Jeeps with a welded flat iron "slat" radiator grille. It was Ford who first designed and implemented the familiar and distinctive stamped slotted steel grille, which was lighter and better suited to mass production. Ford was the expert in mass production so many of their design features, including the stamped grille, were adopted by Willys and implemented into the standard WWII Jeep by April 1942. The grille became such an iconic symbol for the rugged, reliable, and beloved Jeep that rights to the image are still a coveted corporate asset to this day. ww2dbaseJeeps, from whatever manufacturer, served with distinction in every combat zone and every "rear area" of the war. Field modifications were endless; from VIP limousines to garbage trucks, from litter carriers to artillery platforms, from the messenger service to heavily armed rapid strike assault vehicles. They drove over good roads, through deep mud, forded streams, sped over sand, and some even went to sea. In Naval service, besides being used around shore bases in the same ways as at any other military base, some were used aboard fleet carriers as aircraft "tugs." In the ETO, many Jeeps were field-modified with a 3-ft vertical steel bar welded to the center of the front bumper to break decapitation wires strung across roads. ww2dbaseThrough lend-lease, Jeeps of all configurations served prolifically with all Allied powers. Popular among the troops, Enzo Ferrari later described the Jeep as "America's only real sports car." Jeeps became so common in and around the European battle areas that German troops came to believe that each American soldier was issued his own Jeep. ww2dbaseSo ubiquitous was the Jeep and diverse in its capabilities that Gen Dwight D. Eisenhower listed it among the three primary tools that won the war: the Jeep, the Dakota, and the Landing Craft. Interestingly, none of these were weapons. ww2dbaseSources: Wikipedia; Brian's Military Jeeps of WWII; Universal Jeep History; Colin Stevens' 'My MV'; How Stuff Works; Fourwheeler Magazine, March 1995; Ray Fernandez. 11 Jul 1940 US Army approached 135 American automotive manufacturers to submit designs to replace its existing, aging light motor vehicles. They were told that they must submit their first prototypes within 49 days and have 70 test vehicles prepared in 75 days. 23 Sep 1940 Bantam delivered a prototype, officially named the "Pilot" but nicknamed the "Blitz Buggy", to the US Army vehicle test center at Camp Holabird, Maryland, United States for a requirement that would result in the Jeep. 11 Nov 1940 The US army took delivery of its first Jeep. The origin of the name is still a mystery. Some say it is from the Army designation GP (General Purpose) but others prefer the reference to a character from the Popeye cartoon strip known as Eugene the Jeep. The character could walk through walls, climb trees, fly and go just about anywhere it wanted, and it is thought that soldiers at the time were so impressed with the new vehicle’s versatility that they named it after the Jeep. Automobiles of the Dictators: Hitler bought his first Mercedes Benz in 1925 he also had a Auto-Union D-Type. Another Mercedes Benz owned by Hitler was the 1938 770K it was the largest car Mercedes Benz built up to that time. The car was powered by a Eight Cylinder 150 hp Engine with a Supercharger boosting its total horsepower to 350, with a top speed of 100mph. Many of the cars were open top, so he could stand, and was accessable to the people. In 1941 Hitler ordered two Mercedes Benz Model 770K's,they were 20ft.long, with about 2,000lbs of armor plate with bullet-proof glass. The weight of the car was over 5 tons Powered by a 230hp Eight Cylinder Engine w/ Supercharger with a top speed over 100mph. The vehicle held 51 gallons of fuel,giving it about 150 mile range, at 3 miles per gallon! Hitler owned over 9 Mercedes Benz during his rise to power. Another Mercedes was the model 15/70/100 5 passenger car. Hitler also used the Mercedes Benz 6 wheeled cross-country model G-4. In 1973 a 770K, erroneously alleged to have been Adolf Hitler's sold for $150,000.00 Aircraft: Hitler used many types of aircraft, but he later used the Junkers Ju-52 Tri-Engine Transport. Another aircraft was a special model of the Focke-Wulf Fw 200 Condor the aircraft had four engines, greater range and faster speed. Trains: Special Trains (Sonderzug) were powered by two locomotives w/ two armored railway cars. The train was originally named "Amerika" but after the entry of the U.S.A. into the war, the name was changed to "Brandenburg",it was last used on January 15, 1945. Lenin: He used the Rolls-Royce, and at one time used different makes of Rolls-Royce cars. His favorite was the Tzar's Rolls-Royce the model Silver Ghost. Stalin: He used the Rolls-Royce, and had a fondness for the American built Packard, Lincoln and Cadillac. His favorite creation, was the ZIS-110 made by Zavod Imeni Likhacheva. The ZIS-110 was a Soviet-built, automobile that was reverse engineered from the 8 cyl. 140 hp 1942 Packard Super Eight. Stalin did not like to fly, he was scared of air travel. Mussolini: "IL Duce" What the Mercedes Benz was to Hitler, the Alfa Remo was to the Italian Dictator. He used and owned different models of the Alfa Romeo. One of his Alfa Romeo cars, was a 1937/23MM sold for $1,200,000.00. Mussolini also had italian aircraft, and special trains. In Soviet Russia there were only a few model cars produced and all were built in factories belonging to the Soviet State. The Russians built cars from Western designs the German Opal Kadett 1936-1940 models,were called Moskvich 400. Designs from American Ford trucks were built by GAZ, models were modified for russian use. During W.W.II few cars were built most of the auto industry built trucks and other military vehicles. Ford Trucks/GAZ these vehicles were built in the thousands for the army, and not many have survived since W.W.II. The GAZ 51 was the workhorse built in many variants. Some of the vehicles produced are listed: GAZ 12 ZIM passenger cars they came in one color (black). GAZ 11 / 73 sedan GAZ 21 3/axle 6 wheel vehicle. ZIS 110 sedan and ZIS 110 limousine it looked like an American Packard. Did you know: That the Russians had their own SUV vehicle years before they became popular four-wheel-drive, high profile and had all the luxury of russian cars of that time, what ever that was. "Keep on Truckin Comrade"
Automobiles of the Dictators: Another favorite of Mussolini was a 1935 two-seat Pescara spyder, one of only sixty built. 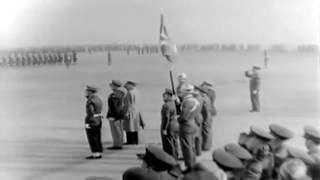 Archive footage shows the dictator saluting the crowds as he stands in the passenger seat. GAZ: (Gorky Avtomobilny Zoavod) Built Ford trucks and cars under licence. Over 100,000 Model A Ford cars and Model AA trucks were produced between 1932 to 1936. The passenger cars, were called NAZ A. from Ford Model A Design. Another design, was a four-wheel drive model called GAZ-61 entered production in 1940. In 1941 an improved model GAZ-73 was built. During World War II GAZ produced over 104,200 ZIS-5V's built in 1942 it was a simplified model over 1,000,000 were built. The basic chassic was used for many different duties. The GAZ was the second most used truck in the Red army. However,it was phased out to secondary duties. The U.S.S.R. also received thousands of lend lease U.S. built G.M.C. 2 1/2 trucks. German Motorcycles: What did BMW, DWK, NSU and Zundapp mean? Bayische Motoren Werke One of the Wehrmacht's Favorite the R-12 and R/75 "Kriegselefanten" (War Elephants) w/side car. Served everywhere the German Army was sent. Had excellent durability, the BMW was rugged to do its job. A Wartime photo showed (7) Fallschirmjagers (Paratroops) w/ equipment on one BMW! After World War II the Russians faithfully copied the BMW R/75. They called their version the K-M72 or the M-72-K it was used for Liaison,Reconnaissance was also assigned to other units in the Red Army. German Motorcycles: DKW Das Klenie Wunder Another favorite of the Wehrmacht served on every front, rugged and dependable. This design has been the most copied motorcycle in the world. DWK also produced a four-wheel drive vehicle. German Motorcycles: NSU Neckar und SUlm First letters in the names of the two rivers surrouding the plant. During the 1930's Germany was the largest producer of motorcycles world-wide. NSU produced many different designs, like all german motorcycles it could also be equipped with a side-car. During World War II NSU built the standard model 250 ZDB and Kettenkrad Sdkf Z.2 it was a cross between a motorcycle and a tracked vehicle. NSU also built different vehicles for the Wehrmacht. German Motorcycles: Zundapp Zuendung Ignition Apparat Machine Was used with the BMW, to establish a motorcycle corps. It is claimed the heavy Zundapp's were surperior to the BMW's, but it could be equal it all depends on what bike you liked. The Wehrmacht used many different motorcycles that were divided into three different types light 350cc, medium 50cc and heavy more than 500cc. The main suppliers were the BMW, NSU and the Zundapp followed by DWK. Like all of the motorcycles used by the German army,it could be equipped with a side-car. Zundapp also built the small wire guided micro tank named "Goliath" among other weapons. Zundapp continued production, until bombing raids destroyed the factory in Nurnberg in 1945. Correction my error, German Motorcycles: should read BMW, DKW not DWK, NSU and Zundapp. All I can do is record historical fact for posterity, and those who read about World War II will make their own judgements. If an error is made it is done without any malice. After World War II Germany rebuilt many of its Industries, as far as the New Order would allow. Did you know that the Russians dismantled the entire DKW motorcycle factory, that was the largest in the world, and shipped it to Russia, the question is was the factory ever rebuilt, or just left to rust. The British stole the entire production of DKW RT-125 motorcycle's before the Russians got their. BSA the British motorcycle firm copied the design for their bikes in the 1950's and 1960's. The Russians copied the BMW R/75 and other vehicles, and copied everything else. But the real winners were the Japanese, who in the 1960's also copied the German design DKW RT-125 for their Yamaha motorcycles. And copied everything else too! So what is really new? everyone copies other designs and ideas turns them around as a new development strange how Front-Wheel Drive was something new in the late 1950s'and 60's the Germans designed an Automobile with Front-Wheel Drive early in the 20th Century, same for Fuel Injection, Disk Brakes, Automatic- Transmissions and other Automotive Firsts. "Economic Politics for the Victors"
During and after World War II the Russians built copies of U.S. designs one of the American Ford GPA 1/4 ton Amphibious Vehicle GPA stood for G Government P 80 inch wheel base A Amphibious. Ford built 12,282 of them during its production between 1942 to 1943. The Russian copy was called the GAZ-46 MAV or MAZ. The vehicle was used by the Red Army for years after World War II. ZIL 151 6x6 Truck was a Russian copy of the U.S. Studebaker, the International 5 ton KR-11 Truck was copied by GAZ. Also copied U.S. Truck was the Reo, many of these trucks were used by the Red Army for years after World War II. When I was stationed at MCLB Barstow they must have had a few thousand classic looking military Jeeps stored at the Nebo Annex. For all I know they are still there in the desert unused - literally in new condition. This is about 1981 or so. What model was the last "classic" Jeep used by the Armed Forces? I'm sure they'd be considered unsafe today, but I'd sure like to have one anyway. Can the Russians improve on the HUMMWV give them time to tear one apart, like the vehicles captured during the Georgia/Russia Conflict over South Ossetia. The Russians have their own version of the HUMMWV its called the GAZ-2975 (Tigr) Tiger Army Truck or the(HMV) High Mobility Vehicle and it will be the mainstay of the Russian Military. Another Russian vehicle is called the Kombat looks like a "jeep" SUV. Ivan did it again. Russian Trucks: GAZ-A Copy of U.S. Ford truck GAZ-M 1 Command car based on 1933 ford V8 about 63,000 were built. A four-wheel drive model was also built called GAZ-61-73 4x4. GAZ-64 Russian version of the U.S. Jeep this vehicle was produced from 1943 until the end of the war and over 4,800 were built. Lesser Known Russian Trucks: YaG, 5 Ton 4x2 Cargo Truck, was the first domestic built vehicle, built from 1932 to 1942 about 8,000 were built, used by the pre-war Russian Army. YaG 10, 8 Ton 6x4 Cargo Truck built from 1931 on it was the heavy truck of the Red Army however the design used much foreign technology, powered by American engines, and copied British suspension system about 300 were built. The Fast and the Fuhrer: Hitler at one time owned an interest in the building of the Auto-Union D Type, this was a racing automobile. Hitler offered 500,000 Reichmarks to build the car, in 1939. It was powered by a Twin-Supercharger, 3 Liter V-12 Engine that produced 485 hp and a top speed of 185mph. During World War II a number of the cars were lost or destroyed. One car was taken back to Russia, after the war to study its technology. It was discovered in Ukraine in the 1980's, it is one of five cars remaining and could sell at auction for over $12,000,000. A Russian Billionaire bought the Mercedes- Benz 770 K ,that Hitler used for $11,000,000! The car was sold in Austria after the war, than it went into a Classic Car Museum in Las Vegas, Nevada USA. The vehicle's authenticity was proven with original documents and through old photo's even the vehicle plate number was correct it read 1A 148461. The Billionaire's Father also bought the Mercedes-Benz 540 K used by Joseph Goebbel's in 1972, after he spotted it rusting in Lavia Other Cars: Hermann Goering's sleek Horch 853 Limousine, and Martin Bormann's Mercedes-Benz 320. Top trophy,the dark blue Mercedes-Benz 770 K that once belonged to Adolf Hitler. Did you know: That at one time (88) Eighty Eight Mercedes-Benz and other automobiles made up the fleet of State owned cars between 1938-1943 other cars were bought as private vehicle's. At the end of World War II the Russians took thousands of vehicle's back to Mother Russia anything that could be studied and built into Russian designs, others were later side-lined due to lack of spare parts and left to rust. Harley-Davidson delivered thousands of the 750cc models w/ sidecar. It could also carry a degtyarev 7.62mm machine gun,and could be setup to carry an 82mm mortar, ammo and crew. However the 750cc model wasn't up to the task carring the extra weight. It was also used with reconnaissance units, military police and for messenger service. Many served the Russian Army for years after World War II. Even before the war, the Russian Army needed a motorcycle they imported BMW motorcycles from Germany and copied them. Today you can buy your own Ural Motorcycle w/ sidecar, the design goes back to the German BMW R-71 the ural was designed for Russian off the road use, have a Red October Limited Edition painted in Red of course! The Russians copied the Harley-Davidson and the German BMW, Harley-Davidson copied BMW, and the Japanese copied the Harley-Davidson V-Twins, and everybody else. "So whats new under the Sun". About those Russian cars: After World War II production of the ZIS/ZIL was resumed in 1946. The vehicle went through improvements and design changes. The GAZ sedan was still used by low-level party fuctionaries who lacked the status of a ZIS/ZIL limo. After Stalin's death ZIS was changed to ZIL ZIL meaning (Zavod Imeni Lihachev Lihacheva)the last ZIL was built in 1958 and the production line closed down. The ZIL is still the Official State Car, and many are still in use for Government fuctions, today the Russian Government uses Mercedes-Benz and BMW Automobiles However, a new more modern design from ZIL will be produced. Powered by a 7700cc/400hp engine with all the new advances in automotive technology,it will be armored and weight in at over 5 tons, ZIL will built between 8 to 10 cars a year, and the price will be around $300,000 dollars. The ZIS/ZIL is a symbol of a fallen empire, but whatever you call it ZIS or ZIL it will always have a certin auster and mysterious charm...to it I guess its because, its a Russian car. Let's start all over again: Its a "Z" what? ZIS: Zavod Imeni Stalina was named after Stalin when he was alive. Look at it this way nobody said no!, to Joe. ZIS was changed after Stalin's death, to ZIL After he died everybody said yes, change the name!. The company built trucks, heavy equipment, buses, tanks and armored cars, besides state automobiles. The ZIS/ZIL Limousines were hand-built and the number of luxury-sedan production was very low with all cars going to the Soviet Government. The first Soviet Luxury-cars were built in Leningrad in 1933, they were big, boxy seven -seat cars and the design was based on the American, General Motors Model 1931 Buick 90 powered by a straight-eight cylinder engine. An improved model ZIS-101 was built in 1936 powered by a V-8 engine w/dual-carburetor, improved gearbox, heater, radio and even factory air-conditioning. The ZIS used high-octane fuel, that was not usually available in the USSR until the 1950's. The ZIS was painted in black, gray, biege and blue. What no red! total production of all ZIS/ZIL cars, were never released by the USSR. Note* A 1946 ZIS used by Joseph Stalin, was bought by a Japanese Businessman in the 1990's for about 1.3 Million Dollars. "Dosveedaniya!" Correction on information about the M-38 Jeep Dated Nov. 29, 2009 04:01:42 PM The U.S. Army used the M-38 Jeep it was replaced by the Ford M-151 1/4 ton. Most of those M-38's were used by the U.S. Navy, U.S.Coast Guard, U.S. Air Force and the U.S. Marines. Now About Those East German Cars... Built by Sachsenring Automobilwerke Zwickau The Trabant meaning (Fellow Traveller) was East Germany's answer to West Germany's VW. First built in 1957 it was a pollution producing vehicle, powered by a two-stroke, 50hp engine that went from 0-60 in about 21 seconds! Built for 30 years with little improvements about 3,096,099 cars were made. Buyers waited up to 15 years for one, used cars sold at a high price. Some owners became skillful in keeping their cars running. The Trabant's engine was derived from a pre- war DKW design. One owner said the car was a pig to drive it took him a week to get used to the gears. The vehicle was built as two-door sedan, Two-door station wagon, even a limousine was built. The East German Army also used the car. Go West Trabant, Go West! After the fall of East Germany thousands of East Germans drove their little trabant's west the car lived up to its name, of fellow traveller. However most of the cars were sold or left on the side of the road. In the early 1990's you could buy one for a few marks,it was looked upon as a collector car. Trabant will make a come back, it has become the little car, that can! by 2011 it will be built by IndiKar a German-based car parts manufacture. It will compete with the Mini and the VW Beetle new Design and Technology will be up-dated, and will sell for about 15,000 Euros. That Other East German Car...Called a... Wartburg 353 this vehicle was also powered by a two-stroke 993 cc, 50 hp. 3 cylinder engine. Some cars were even exported outside the Soviet bloc to the U.K., South Africa and other countries. After the Fall of the Berlin Wall,the little Wartburg faded from the streets. Trucks... Industrieverband Fahrzeugbau (IFA) meaning: (Industrial Association for Vehicle Construction). Built Bicycles, Motorcycles, Light and Heavy Trucks, Cars, Vans and other Industrial Equipment. Trabant, Wartburg, Barkas, Robur, Multicar, Simson or MZ were part of IFA. I am the proud owner of a 1940 GMT 3/4 ton long bed military version pickup. It has original engine and transmission and runs great. It is in restored condition, but is painted non-military. Please help me to find more information about my truck. The military id tags are still in glove box. "The Chinese Connecton" The Chinese Jiefang CA-30 was a copy of the Russian ZIL-157 6x6 Cargo Truck. In the 1950's the USSR assisted China with building its heavy industries, and China established the First Automobile Works (FAW) The CA-30 like the ZIL-157 had cross-country capabilities, and was built in many different versions. The truck was the mainstay of the Chinese People's Liberation Army for years, up until it was phased out of service starting in the 1990's for improved models. Surplus Jiefang CA-30's found their way into the civilian market, and are still seen on Chinese roads. Some militery forces of other countries, still use the Jiefang CA-30. HONORABLE MENTION THE TATRA T-111: Tatra T-111 1942 TO 1962 Legendary for its reliability and off the road capabilities has erned iconic status in harsh conditions like Siberia. Designed and built in Czechoslovakia for the Wehrmacht, many were captured and used by the Red Army during WWII. After the war,the vehicle played an important role in the rebuilding of Eastern Europe and the Soviet Union. The vehicle continued to be built until 1962 being replaced by the Tatra T-138. A total of 33,000 Tatra T-111's were built the truck could carry a maximum 10 tons of cargo, and tow a trailer up to 22 tons! it was a workhorse. The Russians built the GAZ-A Staff Car that was a development of the 1927 Ford Model A about 42,000 were built between 1932 to 1936 The vehicle was simple in design and able to withstand the harsh winter weather that Mother Russia is known for. The GAZ-A served throughout WWII it was powered by a GAZ 4 cylinder gas engine of 42hp. Another GAZ product, the GAZ M-1 Command Car this vehicle was based on the 1933 US Ford V-8 and 63,000 were built, between 1936 to 1941. The car was used by Red Army commanders its one drawback, it was not a 4x4 vehicle it was a 4x2 so its off road service was limited. The GAZ M-1 was powered by a 4-cylinder gas engine of 50hp. MORE RUSSIAN TRUCKS! GAZ-AA 4X2 1 1/2-ton truck was a licence- built copy of the Ford Model 1929. Over 150,000 vehicles were built, it was a workhorse of the Red Army. The truck was powered by a 4-cylinder gas engine of 40hp. GAZ-AAA This truck was built between 1933 to 1942. The last production version had no bumpers and one headlight had simple body- work, but it was rugged and dependable, it was a 6x4 able to carry 5500lb of cargo and had a top speed of 40mph. It was powered by a 4-cylinder gas engine of 50hp. ZIS-5 was produced from 1931 to 1958 and it was another Red Army workhorse. To cut down on steel the ZIS-5 used wooden doors and seats, that must have been a hard ride! no bumpers and one headlight, like the GAZ-AA it was also rugged and dependable. It was powered by a 6-cylinder gas engine of 72hp. Did Chrysler Corp. ever make Jeeps for the military like Ford and Willys? If so what years? POST-WAR SOVIET CAR: GAZ M-20 "Pobeda" which means 'Victory' this automobile was built by GAZ Gorky Avto Zavod (Gorky Car Plant). First designed in 1943 work continued even when the plant was bombed, by November 1944 the first prototype was ready, the vehicle was rear-wheel drive, 4-cylinder gas engine with 3-speed transmission with a top speed of 105km/65mph. It was one of the first cars in the USSR equipped with turn singals, two electric windshield wipers, electric heater and even a AM-radio. FROM RUSSIA WITH LOVE: BUILT IN POLAND Production continued in Poland from 1951 to 1973! talk about sticking with an idea by this time, the GAZ M-20 was in need of a facelift. The vehicle received sheet metal changes, and a 6-cylinder gas engine, but was later replaced by the GAZ M-21 Volga. During its production life, the GAZ M-20 was built as a Sedan, Cabriolet but had low sales Pickup, Station wagon, Military and State Cars, even a Four-door Convertible for those May Day Military Parades, the vehicle was also used as a Taxi Cab and Police Car. BEST USED RUSSIAN CAR: Today the GAZ M-20 is still working the streets in Mother Russia owners of these cars take care and maintain them, but they have also become a collector car. Like I've said before, I guess its because, its a Russian car! A few GAZ M-20s are regestered in the United States, sure would like to see one. --------------------------------------------- Say Jim: Comment 2 Aug 2011 I'm no expert, but this is what I know: During WWII Ford and Willys-Overland built 640,000 jeeps that's about 18% of all the wheeled-vehicles built during WWII. Chrysler had contracts to build Tanks, Trucks Engines, Spare-parts, Bearings, Parts for Aircraft and Assorted Military Equipment. CHRYSLER BOUGHT OUT AMC AND TOOK JEEP WITH IT Today Chrysler builds Jeeps for the Civilian market and Military vehicles. Ford built the M151 used before and during the Vietnam era. It looked like a jeep, but deep down it was a Ford. AM General has ties with Jeep and builds the Hummer for the civilian market, as well as the Humvee that replaced the Jeep in Military service. can someone give me info on the 3 axle 6 wheeled jeep in the movie the thomas crown affare. are they built buy a conversion kit? or buy a coustom shop? and where can i find the info and pictures of one. About 25 years ago I lived on a horse farms that had the remnants of a WW2 vintage jeep which the data plate indicated was build by case. (The heavy equipment manufacturer.). It was painted orange. I went back a year ago and the jeep was gone. The new owner of the property said that it had probably been excavated away when the farm was landscaped. I truly believe that my memory serves me correctly on this. I've always loved the early jeeps since my uncle has an early gpw with the ford script on the tailgate that he claims was one of the first ever built. Very low serial number. That's all I've got to say. Anybody got anything to say about my case sighting? 15 Years ago there was a lady living near Lake Travis (Austin, Tx) who put a "jeep" her husband had(deceased) up for sale. He was a GM exec and the jeep was a small 2 man, Indian motorcycle engine powered, 4 wheel jeep developed for the Marines (airdrop). It was never put into production. The body was made up of plywood bolted to metal framework ....really light. Anyone know anything about it ? Wish I had taken pictures. I told the military motorcycle collector in Washington state about it. I think he bought it. I like the website but it needs to tell more about every kind of jeep and what was more about how it ran too. I have just purchased a Ford GPW chassis 200395. I know its 1944 production vehicle. Do you know if Ford production records are still available to find out what month in 1944 the vehicle was actually made? i have been searching historic records on the web but could not find any detailed information. Would like to know what location my 42 GPW, serial #8147 was made? And would you know if this jeep was used state side or somewhere overseas? Do World War 11 military jeeps have titles? How can I find out the war history on where my jeep was based on serial number? Have friend, either retired Col or Lt.Col. who has 1943 F Jeep, no tail gait, for reference, and wants to know the jeeps assignments in Europe mainly. But if possible history of its assignments until it came into his hands or exited the Army. Thanks for your help. If other source/s can assist in this please advise. I will be obtaining VIN# soon. Is it true that it can be repaired with one single tool? How do I follow my 42 MB. from where and when it was built? to where it served? I have a 1941 (12/09/41) it has a serial number 103071. Can this help me find where it was assigned? Thank you in advance foe any help you might be able furnish me with. How can I get info on where my 1943 Ford GPW serial #91920 was built and served. Data plate shows 01-08-43. I have 1941 mermite carrier, complete with pans. It has SV-135 stenciled on the outside of it. Can you tell me what this refers to? Can't find it anywhere. Thanks so much. I have a 42 GPW. The side of the block says Gpw 8015. Can I find what unit or units it was assigned to?